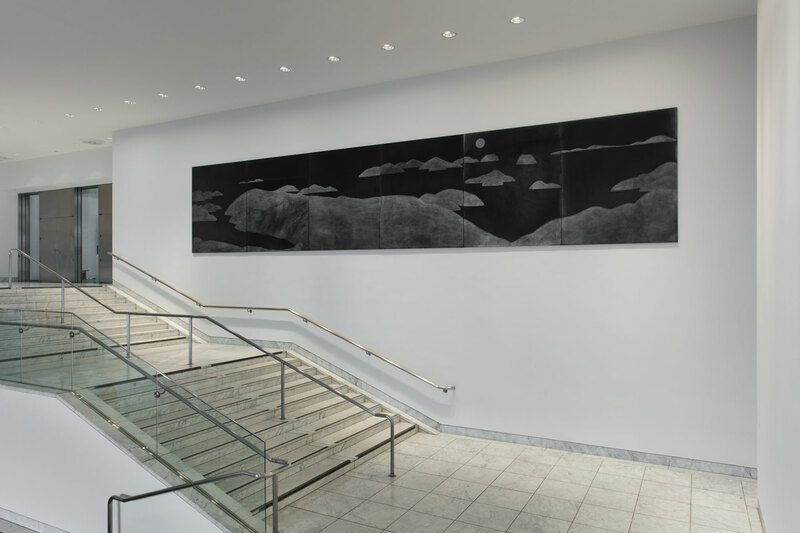 Despite her usual tendency toward parlor-size grisailles, or relatively small paintings executed in gray monochrome, Silke Otto-Knapp was commissioned to make a single large-scale painting for the Hammer’s lobby wall. Often based on preexisting photographic material, Otto-Knapp’s paintings can be described as art about art: when they are not making reference to culturally significant personages or performances (dance, theater), they generally default to being about other modes of painting. Stylistically the artist eschews detail, as forms and figures are rendered in the most elementary manner. Rendered in black and gray watercolor pigments, her paintings are based primarily on contrasts of light and dark and come off as fragile, unsentimental, and in some respects entrenched in the shadowy billows of the past. The lobby staircase is indeed haunted by projects past, and Otto-Knapp was invited to engage with the space because she is historically minded. For some time Otto-Knapp has wanted to execute a work related to the figure of Georgia O’Keeffe. 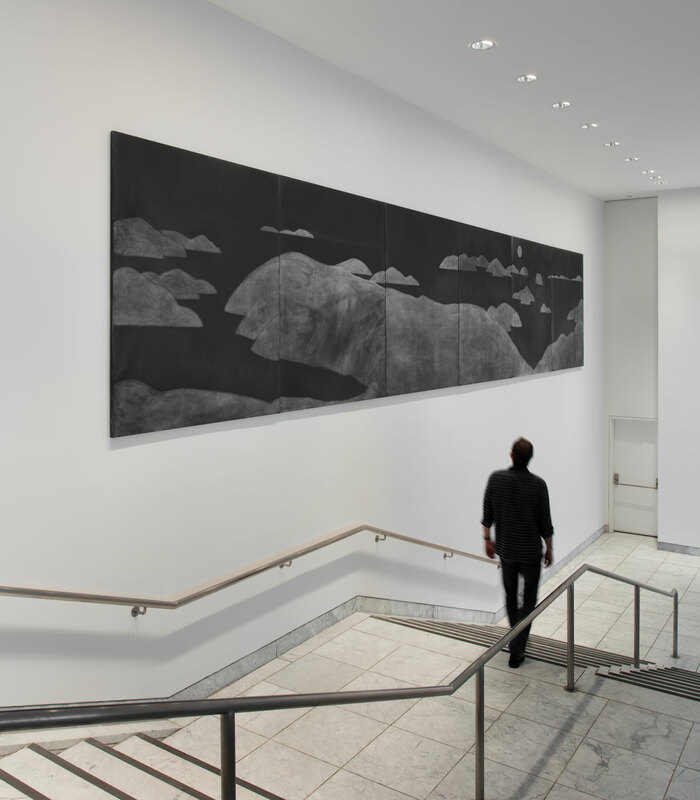 Given that O’Keeffe’s most monumental work, Sky Above Clouds IV (1965), graces the landing of a staircase at the Art Institute of Chicago, this invitation provided an ideal excuse. Sky Above Clouds IV is twenty-four feet in length, and its placement has made it an icon of the institution where it is sited. The painting is a simple abstract composition, and the architectural space that it inhabits never reconciles itself with its illusionistic pictorial space. To a similar end, Otto-Knapp’s Seascape (with moon) (2016) occupies a transitory pathway and casts its lens on traditional subject matter. The scene is characteristically murky, positioned from such a viewpoint and rendered in such a way that its sense of place is unstable. 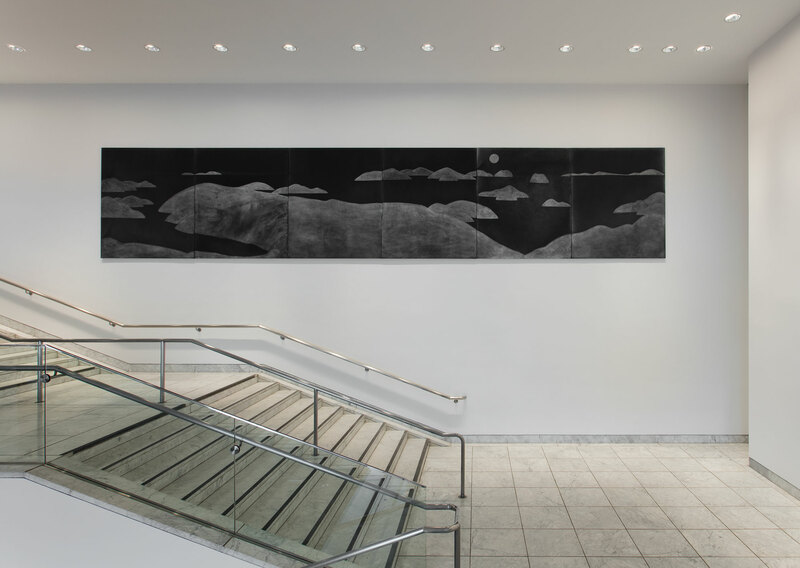 Representing sea, islands, sky, and moon amid an evasive horizon line, the painting floats in all its dimensions, just as O’Keeffe might have imagined that her monumental canvas—set above, below, and within the clouds—would.